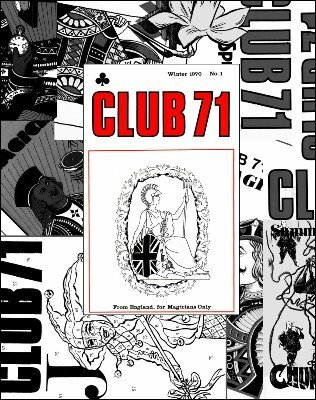 Club 71 magazine ran from 1970 to 2007, with a break from 1978 to 1984, and was produced by Geoff Maltby the owner of Repro Magic (UK). [The name 'Repro' comes from the fact that Maltby started out selling REPROductions of magic posters, at a time when posters were hard to come by and very expensive.] For most of the time Walt Lees was the editor. In its later years it changed its name to The Magician. The total run consists of 193 issues, almost 14,000 pages, plus a parody of Abracadabra magazine. Due to its irregular publishing schedule, name change, format change and five year publication pause early in its existence, it was impossible to find someone with a full run. This digital version was assembled from three different partial collections. This also means that this wonderful magazine is not as well known and not as well studied as other magazines, a fertile ground for the magic treasure hunter. You will find several high profile authors, such as Barrie Richardson, Max Maven (Phil Goldstein), Peter Duffie and Patrick Page, who have contributed many effects and articles to the magazine. Barrie Richardson in particular has a contribution in almost every of the 190+ issues. Other frequent contributors are Simon Lovell, Angelo Carbone, Al Smith, Ian Rowland, Ian Adair, Walt Lees, Eddie Daws, Werner Miller, Ian Keable, Peter Kane, Paul Hallas, Stephen Tucker, JJ, Bob Ostin, Ali Bongo, Ali Cardabra and many more. The subjects discussed span everything from mentalism and cards, to magic for children, close-up, cabaret and include not just effects but also the business side and a range of provoking articles bound to make you think and ultimately improve your magic. Club 71 is particularly strong on magic for children. You will find numerous contributions discussing what to do and what not to do, how to increase your business and what effects to perform.